As the cold weather approaches, a Maryland man is aiming to outfit D.C. in a way that gives back in local neighborhoods. WASHINGTON – As the cold weather approaches, a Maryland man is aiming to outfit D.C. in a way that gives back in local neighborhoods. Brian Lieberman’s business wants to give out 300 pieces of warm clothes to the homeless with the simple model of buy one, give one. For every hat, scarf or pair of gloves bought, Lieberman makes it his mission to donate a like item locally. All of the warm clothes given out by his company, Twice As Warm, go to people living in shelters in the District, Maryland and Virginia. Twice As Warm started in 2010 on a ping pong table in Lieberman’s parent’s basement in Rockville, Md. That winter, Lieberman met his goal of giving 210 items of warm clothing to local people in need. “By starting this project, it was a way I could just get started right away to help people directly down the street from me,” Lieberman says. Now going into its third winter, Twice As Warm is working with the National Center for Children and Families and public schools in D.C. and Maryland employing the same business model. Last winter Twice As Warm worked with Miriam’s Kitchen in the District. Jennifer Dean, who runs the kitchen’s development, says helped the non-profit dodge a common problem, inappropriate or unusable donations for the men they serve. So when a brand new piece of clothing is donated, it’s an unexpected luxury for the people they serve, she says. “For us to be able to give them something new that hasn’t been used, it’s just nice for them and makes them feel appreciated and just that somebody cares,” Dean says. Focusing on connecting residents to those in their community who are in need is what motivates Lieberman. “Every time they wear one of our products they’re reminded that they’ve helped someone in need and there are people in need in their own community that they can help, which I think a lot of times people forget,” he says. The topic of homelessness is not one people like to talk about, Lieberman realizes, but he hopes the power of a good deed will put the conversation back on the table. “We’re trying to spread awareness about homelessness and that we don’t need to be ignoring the people in need,” he says. 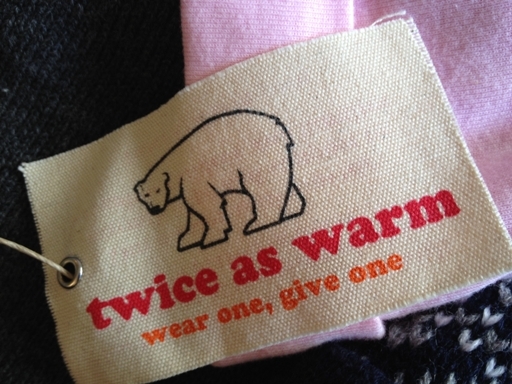 Twice As Warm is working on getting the word out about its mission and is working with local events to reach more people. It will have items on display at the Thirst D.C. event on Thursday, Oct. 25 at 7 p.m. at 915 F St. NW. Find Miriam’s Kitchen’s donations wish list here. Find Twice As Warm here.